I and my family have used Mexican dentists in Nuevo Progreso, Mexico for 18 years. Choosing a dentist in Mexico is tough. There are nearly one hundred dentists in Nuevo Progreso and every border town has a multitude. I recommend only Mexican dentists I personally know, or who were recommended to me by people I trust. I've recommended Universal Dental Clinic since 2006. Dr. Barajas is the good-looking guy in the pictures above. I am the old (but ruggedly handsome) guy. Nuevo Progreso, Tamaulipas is on the Texas-Mexico border, near Weslaco, TX. If you want to jump to prices, please click here. I can honestly recommend Universal Dental Clinic. I use them. My family uses them. I have sent many strangers to them, and some have become friends. What else would you want in a recommendation? Before you write, please read on. No, they do not have a web site. I am their representative. Dr. B. would rather I do the pre-patient interaction and he do the dentistry. Lots of dentists have web sites and a lot are slicker than this one. I am not slick, but down-to-earth and treat you like family. These dentists have been in business in the same location, going on 12 years and Dr. Barajas graduated from dental school 18 years ago, as did Dra. Karina. Dr. Bazan graduated 11 years ago. I have only two rules. Please read these so I can help you better. 1. If you need a same-day or next-day appointment, I do not do that. Allow 2 business days lead time. 2. I send you a map, address, phone and directions when I confirm your appointment. Dental care in Mexico costs about one-third or less of what dental care in the U.S. costs. (Root canals and crowns cost around $200). There are scads of dentists in every border city, but I only work with one across from Donna/Weslaco, TX, in Nuevo Progresso. The correct spelling is Progreso, but gringos often spell this town on the Texas / Tamaulipas border, Progresso. If our smiling faces have convinced you Dr. B. is right for you, please write for an appointment, otherwise, please keep reading. Should you decide to make an appointment, please let us help you with the link below. Please see the prices page before you write and ask me what your work will cost. If you are trying to get an appointment for today, please do not write. I have worked very hard to squeeze people in only to find that they stand us up or find another dentist. For implants & periodontal issues, click here. Yes, Nuevo Progreso is probably safer than wherever you live. Please read what I wrote before you write. I go to Nuevo Progreso regularly with my family. What happens in Reynosa or Matamoros or Laredo has nothing to do with this small town. If you would rather believe the negative press than me, that is fine. Just don't write me to argue with me. You are entitled to your opinion. Although Universal Dental is in Nuevo Progreso, Mexico, most people stay in Weslaco, Harlingen, Pharr or McAllen, Texas. You do not drive across to Mexico. You park your car in Progreso, Texas and walk the block to the dental offices. I send you a map and directions when you make your appointment. You will save money and I will make a buck or two if you click the Booking.com link on the side of the page. There is no dentist in Nuevo Progreso that does sedation dentistry. No dentist, Mexican or from any country can absolutely guarantee that you will experience absolutely no pain from a dental procedure. However, when you read the testimonials, most patients happily commented on the lack of pain after seeing Dr. Barajas or any dentist at Universal Dental Clinic. Universal Dental Clinic in Nuevo Progreso does not do Zoom whitening. Dr. Barajas is not the lowest-cost dentist or the highest-priced dentist in Nuevo Progreso. There are others who charge a little less; some who charge much more. Dr. Barajas and I do not negotiate or discount his work. It is fairly-priced as it is. If you want to barter, please choose someone else and good luck to you. There are three dentists at Universal Dental: Dr. Barajas and Dr. Karina (his wife) graduated from dental schools in the state of Tamaulipas. Dr. Manuel Bazan is an endodontist, or root canal specialist. Even though he looks young, he has 15 years as a dentist and 6 as an endodontist. He graduated from dental school in Mazatlan, Sinaloa. Letting me make your dental appointment does not cost you a cent. You pay the same price as if you found the doctor on your own. 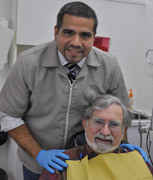 Dr. Barajas prefers it this way because I take care of your questions and his office staff concentrates on dentistry. Please look at the price list before writing. If you need something else, please ask. Write for appointment. If you are trying to get an appointment for today or tomorrow, please do not write. I have worked very hard to squeeze people in only to find that they stand us up or find another dentist by the time I get back to them. Please read the testimonials (in the menu above) from patients who used these dentists. I put these testimonials up to reassure people who don't know me or Mexican dentists. If that, or the style of my writing do not reassure you, there is nothing else I can do to win your trust. Thank you for looking and I hope you find someone to help you. Write for an appointment Please read the wait time for crowns or dentures or bridges. You can pick a Mexican dentist in Progreso by who has the flashiest web site, but wouldn't you really rather have the security of a personal recommendation? I feel this is a real service to people like me who cannot afford dental care in the USA. I wish there had been somebody like me to save me from my bad Mexican dental experiences. That's not a negative slur. There are many good Mexican dentists. Nuevo Progreso has 90 registered dentist offices and probably 100 total dental offices. I just hit two who might have been good dentists, but a little greedy. A few years ago, I picked a dentist in Nuevo Progresso by how fancy her web site was. Her office was really nice and had a big sign on the main street. She spoke English. She told me I needed 3 root canals. This could have been true, but since she charged $400 a tooth. I was hesitant to invest the Nelson family fortune. A friend referred me to a dentist who didn't think I needed a root canal and suggested we wait and see. I still don't need those root canals. During a visit to Nuevo Progreso recently, I noticed that she no longer has offices there. Maybe her greed did her in. Not all dentists were created equal, in Mexico just as in the United States. Some dentists chant, Drill baby, drill. I went to one dentist who said I had 17 cavities. "Lo me dudo," (I doubt it), I said. I went to another Mexican dentist who said I had gingivitis. He was right. Learn from my mistakes. So, I decided to help other gringos avoid my experiences. But my dentist is not the only good and fair dentist in Nuevo Progreso. There are probably more honest ones than not, but how are you, a stranger, to know? That's where I come in. All I do is make the appointment. You pay the doctor. Cash or personal checks are accepted. No credit cards. Yes, he will fill out the forms for your dental insurance, but does not bill them. You pay him then get reimbursed from your insurance. Prices on next page. Please note the doctors accept cash or personal checks only. No credit cards accepted. So Where The Heck Is Nuevo Progreso? See the map below. Nuevo Progreso, Mexico is near Weslaco, Texas in deep south Texas. You can fly into Harlingen or McAllen if you do not want to drive to the Rio Grande Valley. All American and Canadian citizens need a passport to get back into the USA. You can fly into McAllen, TX or Harlingen, TX. It is best to rent a car, rather than take a taxi. If you are coming from far, far away and getting a crown, dentures or other procedure that takes 5, 6 or more days, here is a link to book a hotel. The closest town is Weslaco. You may also consider Harlingen or the beach resort of South Padre Island.